Past the shop and café. At the base of a dark sky. Casting their lines into the ocean. Writhing on the deck at the end of a line. Left and right over the water. The beach is now dotted only with toy buildings. 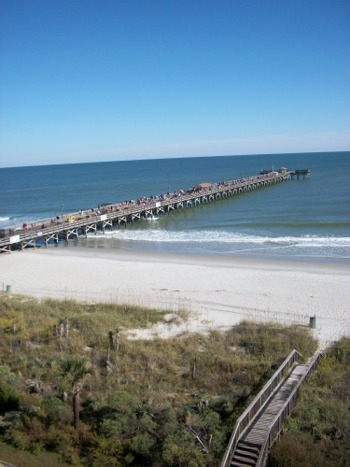 I attended a conference in Myrtle Beach, South Carolina, and the resort where I stayed had a fishing pier. The day I arrived at the resort, I had no obligations, and I walked out onto the pier at about 10 o’clock at night. This poem is about what I experienced that night. The picture above shows the pier in daylight, though it does not show the shop and café referred to in the poem. My walk took place October 27, 2010. I wrote a few lines of the poem the next day, but I did not finish it until November 5, 2010.